This page describes the current state of the model, and poses some open questions to be address. The focus to date has been on the description of conversions (rating tables) and associated metadata. Description of gaugings (rating observations) is underway. The XML encodings are a starting point. No work has been put in to optimising the encoding, it's fully expanded XML element encodings. A ConversionGroup contains 1 or more ConversionPeriods that define applicable Conversions within a start/end time. A conversion may be represented using a table or an equation, however a ConversionTable is the mandatory exchange target (this constraint is not shown in the model). Conversions are defined by the parameter (phenomenon - GF_PropertyType) they convert from and to, as well as the monitoring point that have been developed for (monitoringPoint relationship). ConversionGroups are defined for specific paramTo/paramFrom/MonitoringPoint groups. A Conversion contains metadata relating to its current status, review lifecylce etc. A conversion may be related to its source definition (e.g. an expanded table may be related back to its original equation form), however the equations themselves are not defined in a machine readable form (a formal equation model won't be developed). A ConversionTable is composed of 1 or more tuples that define the independent and dependent variable values as quantities. The table is an expanded, linearly interpolated table. The granularity of the points is defined by the exporting system, but should be sufficient to re-use the table. The ability to link from the conversion to the gaugings that were used (or excluded) in development of the table has been discussed, and modeled, it's just not shown. This is a very simple example, not based on actual data. 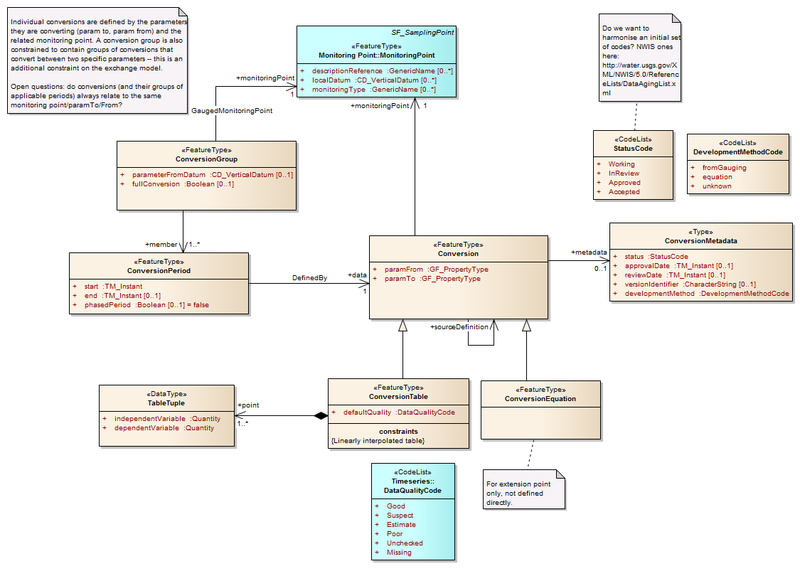 Provided as in example of what the XML of the above model would look like (the schema has been generated from the above model -- example handcoded). <!-- each conversion defines the paramTo and paramFrom as well as the group. 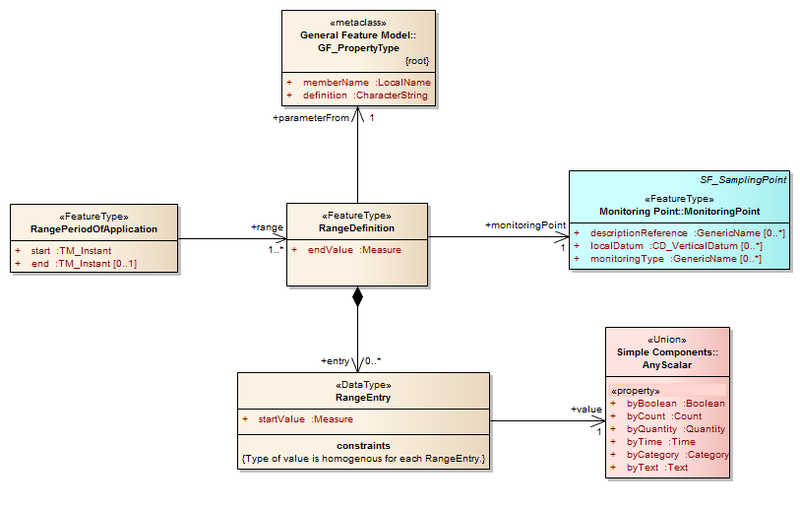 Range values (as describe here: http://external.opengis.org/twiki_public/HydrologyDWG/RGSRangeValues) are used to described data that applies across a range of the independent variable, such as a state or condition. There is no top level collection class shown here. The period of application defines time bounds for which ranges may be used (may be multiple RangeDefintions for an application period -- this differs from conversions). A RangeDefinition is defined according to the independent variable (paramFrom) and associated to a monitoringPoint. The Range is composed of mutliple range entries that have a startValue from which they apply. RangeEntries are valid up to the next RangeEntry startValue. A range entry's value may be a scalar type (e.g. a quantity (mannings N), a category (flood level), free text (descriptive) etc.). This is based on some of the examples within the range value description page. <gml:description> This is a hand crafted example of the range-value concept for WaterML2.0. rgs-38 : Does a coversion always apply to the same ParamFrom /ParamTo and Site/MonitoringPoint? RGS 36. There was discussion of engineered structures and conversions that are re-used across sites, e.g. flume relationships. How do these get identified? For actual use they would be 'bound' to a site. rgs-40 : Metadata for including/excluding gauging observations as references. Do we need the reason they were excluded/included? Examples of this in practice? We modelled this but not currently shown in the above model. rgs-41 :Should we define a vocabulary supporting conversion release status? regs-42 : re rgs-7. Is there a need to implement shifts to enable the actual source system representation? Is rgs-7 a free form extension point that would implement a specific data systems information model? Add a property domainFeatureType that indicates the type of the feature that the conversion was developed for. E.g. a storage feature, such as reservoir, dam etc.